While many of you know me as a bread baker, I consider myself a self-defined “jack-of-all-trades.” I do bake bread, but I also dabble in writing, teach in a public school, garden, create pottery, watercolor with my grandson, and stencil nearly all open wall space in our little farmette. Nobody could accuse me of not being willing to try something new and I’m as happy with a white ribbon at our local fair as I would be with a blue. I recently began to understand the difference between what I do in my random sort of way and what it means to actually narrow your focus and hone in on a skill. 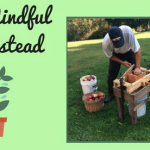 In the age of instant oatmeal and leftovers warmed in the microwave, who among us has the fortitude to stick with one thing long enough to go beyond fine tuning into the realm of mastery? I certainly don’t stretch myself into the science and technique to perfect brioche when it‘s enough to just make a brioche that tastes good. That’s the difference between a dabbler like me and a master-baker. We may both start out with a seed of passion but the master-baker continuously cultivates that seed with a good scoop of self-motivation and a cup or so of good old fashioned stick-to-itiveness. That’s the kind of people I found in front of the open hearth at the Governor’s Palace in Colonial Williamsburg. 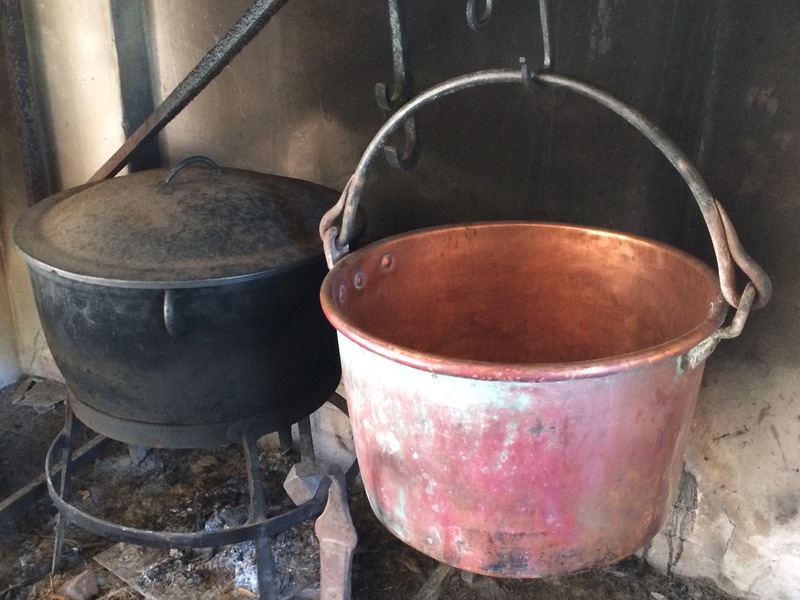 Several years earlier I’d bumped into one of the bakers, Tiffany, as she was pulling bread out of the bake oven at the armory on a sweltering Virginia afternoon and couldn’t resist blogging about it even then when I wrote 18th Century Bread…and Life. 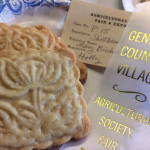 Technically hired as summer help, she already had built a portfolio that included museum work in Pennsylvania, running food programs, and a masters degree in colonial history. The competitive process to become an apprentice may be the easy part when compared to the rigor of what follows if you’re lucky enough to be hired. Food apprentices must complete a 5 level process with 25 recipes per level. In and of itself that seems daunting. Add to that each recipe has to be completed 5 times under the guidance of the master who, in this case, is the head of the Foodways program, Frank Clark. It felt like a sacred act when Tiffany let me peek at her level one list which wasn’t just about dishes like Tripe Kilkenny and Onion Pie but also about technique. Before passing on to level two, for example, she’d need to demonstrate 18th century techniques in poaching and jellies. Tiffany cooking in the Governor’s Palace in Williamsburg! I have no doubt that a long, passionate road lies ahead for Tiffany. I suspect when her apprenticeship turns officially to mastery in a culminating dinner party, any recognition she receives may pale in comparison to her own well-deserved sense of accomplishment. Colonial Williamsburg is committed to preserving the trades of our past. When you go, be assured that there is a rare depth of knowledge and experience bubbling just under the surface wherever you happen to look. Pack your curiosity and ask plenty of questions when (not if!) you go! Over the years, our garden here in upstate New York is definitely under the influence of past Williamsburg master gardener, Wesley Greene. 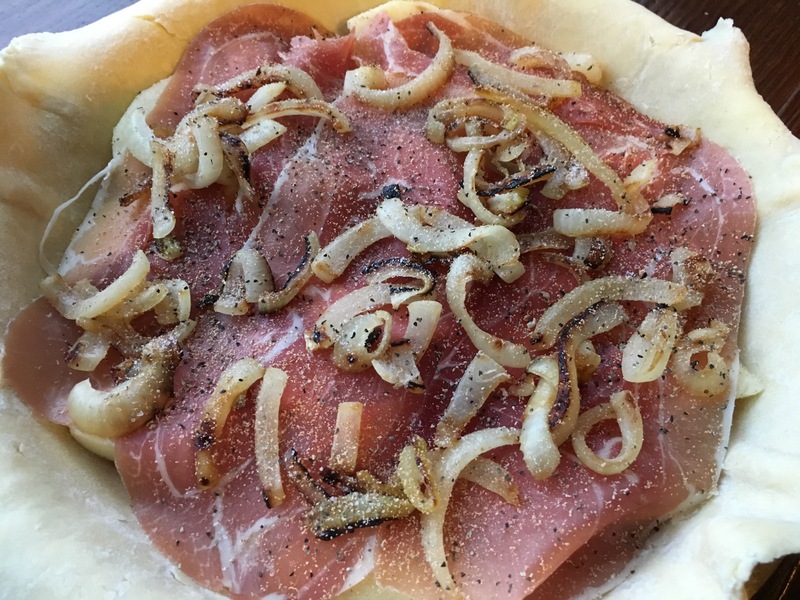 The idea for our farm table sprung to life at the carpenter’s shop, and this time, I came home from the 18th century determined to try level one Onion Pie. I made it once according to the recipe on the Foundations website History is Served and then modified it since everyone in my family seems to be an accredited food critic with advice to share! 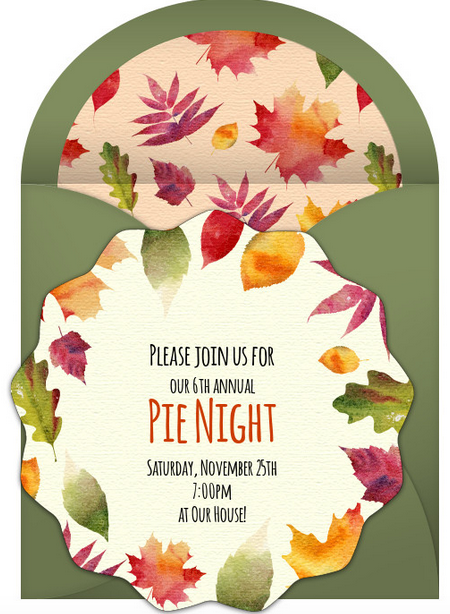 When Darrell and I were invited to an annual pie night (yes, pie night!) 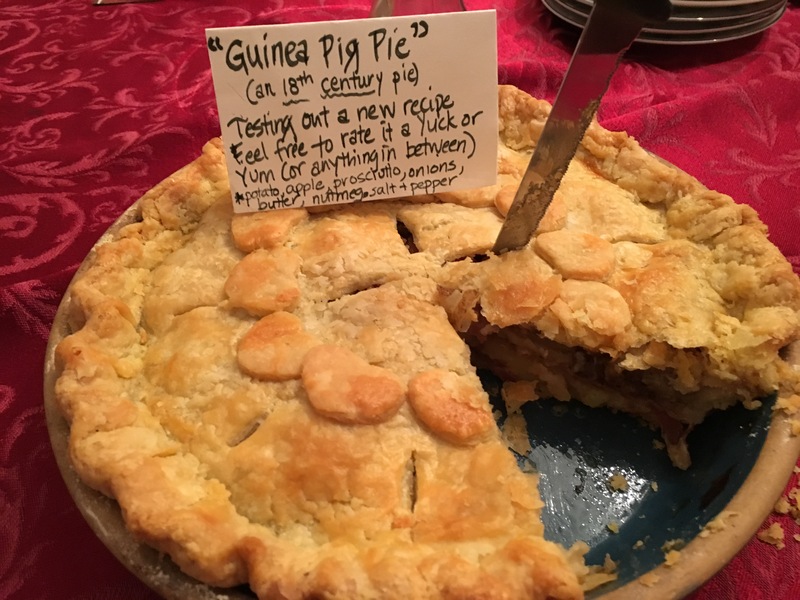 I decided to test it out with the modifications on a wider audience, guinea pigs so to speak, and donned it Guinea Pig Pie. If you happen to be gluten free, try this filling baked, covered, without a crust! I’m sure it would be equally delicious! Leave out the bits of butter in lieu of coconut oil and you could easily make this dairy free as well. 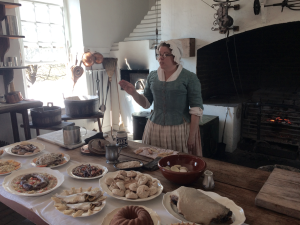 Thank you Colonial Williamsburg for keeping the food traditions of the past alive! Hopefully our founding mother’s would fogive me the small modifications. 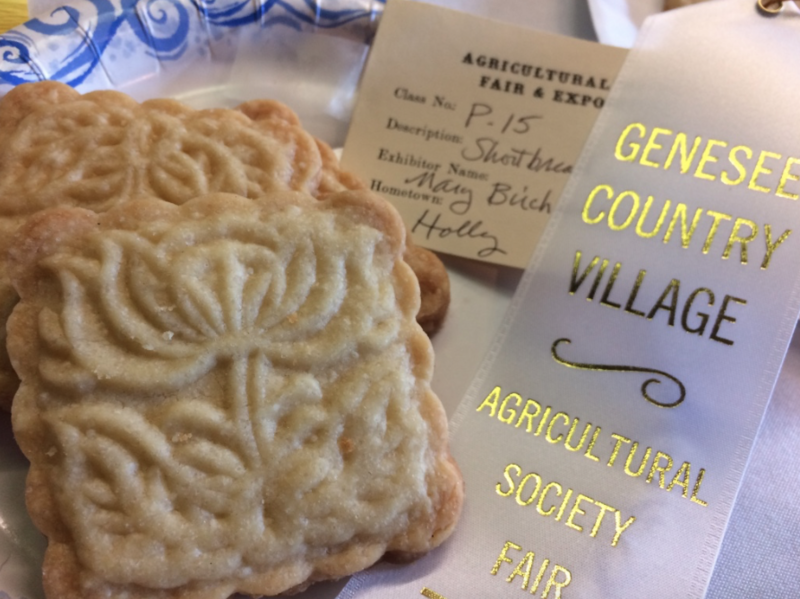 Hope to see you around the bread bowl, strolling around the colonial village, or at the Genesee Country Museum’s maple festival (coming soon!) I’m dabbling in maple recipes for the Cooking with Maple contest. Check out my past winners: maple walnut biscotti, maple cream cheese coffee cake & roasted veggie pizza with maple balsamic glaze!! 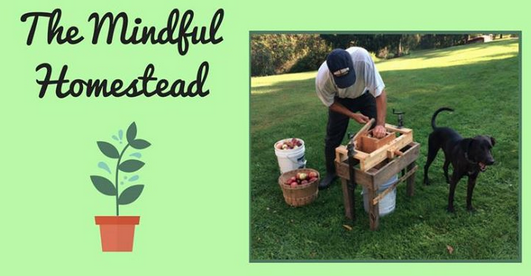 Darrell and I are also presenting The Mindful Homestead locally. Come join us. I’ll have sourdough starter to share! 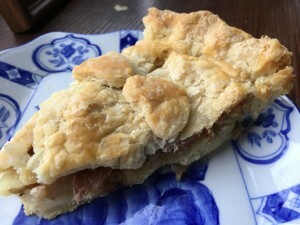 *based on an Onion Pie recipe from Colonial Williamsburg’s website History is Served. I’d suggest trying it in their version from the 18th century, too. This recipe has been modified to suit our family’s taste! Pare and slice the potatoes and apples. Slice everything ¼ inch thick. Place the apples and potatoes in a bowl of water to prevent oxidation. 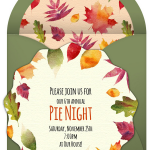 Roll out the bottom crust and set it into the pie pan. Drain and dry the apples and potatoes with a towel. 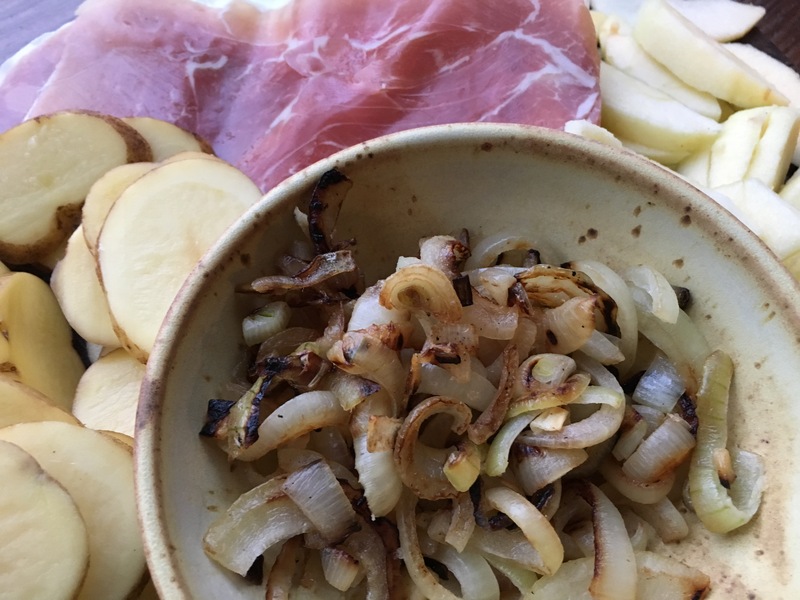 Begin the layers from the bottom up with potatoes, then meat, then apples and then onions. Sprinkle each layer with a little of the seasoning and little bits of the 2 remaining tablespoons of butter. Continue filling and seasoning the pie until you are out of ingredients. Put a top crust on the pie and crimp the edges. Cut 4 or 5 slashes on top crust to allow steam to vent out. Bake for 45-50 minutes or until the crust is a nice golden brown and knife slides easily through filling. If crust is browning too quickly, cover loosely with foil. 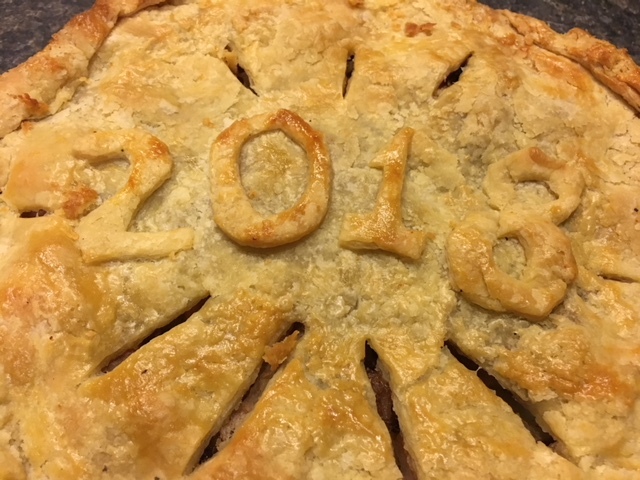 This was the perfect pie to ring in the new year! This entry was posted in Recipes by Mary. Bookmark the permalink. I can’t imagine any comments other than YUM for this pie. All of the ingredients pair perfectly for taste. I plan to (try to) make it. This looks delicious! I love the history of it and learning about what it takes to be a chef in Williamsburg. Thanks for sharing!